It's a good suggestion. It would, however, bend downward in a dive reducing some of the reflex force needed to pull out. My approach is to get a basic form of the glider flying. If it actually shows any kind of promise, there are bound to be improvements, either by myself or others as the design evolves. Today I figured out how to cover a model that doesn't have a complete frame. I'll post a description and photos when I get farther along with that process. The full scale glider will be easy to cover - somebody will sew a sail for it. Why put the fancy and heavy high-speed dive recovery stuff on it if it will not be flown high enough to recover from a dive in the first place? I would think luff lines would be sufficient. I also think luff lines are sufficient for dive recovery, Rick. The reason for a small amount of "all the time reflex" is to add more pitch dampening so it isn't so sensitive in pitch control as to be more difficult for beginning pilots to fly level. The flex wing gliders flying today, as far as I have observed, all have some permanent reflex for that reason. That said, another advantage of the flex wing is that just the changing of the sail as the angle of attack changes provides pitch damping that a rigid wing doesn't have. But I want a well damped basic trainer here so students don't go bobbing up and down as they try to find a "sweet spot". it should be as forgiving in pitch as the Condor 330. I believe the truncated tips can be a huge force in the dive recovery system (as on the ASG-21), on your proposed new trainer design. I have a few thought to add, there at the tips. The shorter, the thinner (in wall thickness). and the smaller (in diameter) that the trunk tube can be, the better. If junction plates and bolts are used at the end of the trailing edge, I would suggest using thinner, high-strength plate alloys there, and maybe even hardened aluminum bolts (or aircraft-grade blind rivets), to save weight. Any extra weight at the tips will reduce the good handling and turning of the glider. The truncated tip goes rearward from the leading edge, but the angle of change may be too sharp, as now proposed. A much shorter trunk tube, also smaller in diameter and with a thinner wall thickness, may be continued outward by a flexible tip wand rather than aluminum. The flexible tip wand may be more "survivable" in a dragged-tip landing, also. A wingtip that "gives" a little will be more forgiving (in ground contact) than a rigid wingtip, for the student. I believe the glider wingtips would benefit (aerodynamically) by adding some roach (not much) to the trailing edge, with benefits both for handling and for weight reduction (as in more sail area with less metal framework). Still putting more mind and body effort into building the model right now. A lot of detail design effort is still ahead when going to the full scale glider. Getting it to fold easily and compactly is going to be a big part of that. So, I can't sew a sail for the scale model and I intend to cover it with iron on model airplane film called "Coverite". It has a heat setting adhesive coating that activates well below the temperature at which the film starts to shrink and of course I won't be shrinking the covering on this model. The question: How does one put iron on covering on a model in which not all elements are supported by a rigid frame and the rib battens are flexible and easily distorted by downward pressure? The answer: Provide a temporary rigid structure that supports the battens in their correct positions and can be removed after the covering material has been adhered to the battens with a hot iron. To do this I made the battens into full ribs, using corrugated cardboard, that extend from the underside of each batten rod to the virtual bottom surface of the glider structure. Then I made a base structure that holds each rib in place and vertical. The base structure captures the bottom of each rib without being attached to it. After it's covered, the whole glider structure can be lifted out of this rib base holding jig. Then the cardboard ribs can be cut loose from the batten rods, where small strips of tape holds them, and removed. Now the underside of each batten can be securely taped to the underside of the covering material. The heat activated adhesive is not strong enough by itself. Seems like this will work. What could possibly go wrong? Murphy is standing by. I'm going to change the center batten. I'm now thinking that the reflex is too abrupt. I'll go back and spread it out over more of the rear portion of that batten rib. This will be similar to what the Condor 330 does with a loop that goes around the rear kingpost cable and lifts the rear of the sail center pocket. Because I used the "Swallow Tail" design, the center rib reflex should be very effective in trimming the glider for a more forward CG and good pitch stability. Enjoying my toasty desert cabin right now. When I get back to this project I'll reform the center batten, make a new cardboard support, and post a photo of it. BTW- The cardboard support of the center batten will stay with the glider from the cross spar back to the tail. This will simulate the center sail pocket and act as a vertical stabilizer to reduce the effects of adverse yaw. I'm also going to elevate the trailing edge of ribs 5 so as to tension the sail, when under positive load, a little more at the tip. Hopefully reaching a good compromise between tip efficiency and weight shift roll control. That said, let me ramble on about this project and its future. This would be a very good project for a university with a well funded and gung-ho aeronautical engineering department to take up. A group of good minds and with technical equipment like computer modelling and wind tunnel testing could optimise a basic trainer design. You have realized by now that I am doing "seat-of-the-pants design engineering on this quest for the ideal hang gliding trainer. 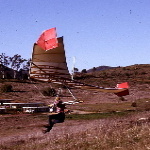 I'm using years of experience in designing, building, and flying R/C gliders along with having designed, built, and taught myself to fly a high performance rigid wing hang glider in 1971 & '72. The leading edges were 2" OD, 6061-T6 "Rain For Rent" irrigation tubing, full of scratches from old extrusion dies. The trailing edges were dirt cheap titanium 3/4" x .022 wall tubing from Douglas Aircraft surplus sales. Other parts were aluminum tubing from the same source. The ribs were cheap plywood. The whole thing was held together by steel carton strapping tape generously donated by Bob Seymour, my employer at that time. The covering was polyester dress lining from Penny's Dept Store. The sealant was urethane varnish from Ace Hardware (which turned an ugly shade of brown over time in the sun). The fiberglass sleeve that joined the two halves together at the cross spar was made by me using old prepreg cloth I had pulled from Taylor Fiber Co's dump, by the railroad tracks, in La Verne, CA. I wrapped it around a tube covered with polyester film and baked it in my kitchen oven until it set. Amazing that it still set after years of storage in my garage. Ah, but the Colver Skysail flew and it flew well but was definitely not a "hang gliding basic trainer". So, yes one can do a lot with a little but can do more with more. I have noticed a lot of interest in this thread judging by the large number of views over its short lifetime. However, there are not enough comments and suggestions to come close to the number of views. Let's hear from some of the "lurkers" viewing this thread. What are your interests? Are some of you from an university areo sciences class? I hope so. Are some of you just waiting to see if I come close to achieving my goal of an easy trainer to revive hang gliding with younger pilots? Are some looking for a future product? Are some waiting to gloat if i fail? My blessings to you all. Please, speak up! I have a lot of confidence in achieving at least some measure of my goals here but with full knowledge that others will improve upon whatever I have started. I sure hope so. A lot of today's pilots learned to fly in a "standard Rogallo" which was not quite so easy to launch but was easy to ground handle, fly, and land. But It had a lot of shortcomings aerodynamically and required a steep hill to train on. i'm trying to achieve the same ease of learning without the shortcomings. Hopefully, the glide path will be longer (it should be) so that shallower hills can be used. Here's a photo of my change to the center and tip batten rib design for the scale model. The reflex in the center is more gradual and will accommodate the sail layout better. The tip batten is raised to begin the tip twist and reduce the billow under positive load. The solid support material under the center batten, from the cross spar back to the TE, will stay with the model to provide some vertical stabilizer effect to control yaw. On a full scale version this would be part of the keel sail pocket. When do you plan to start flight testing?